This is the virtual end of virtual me. 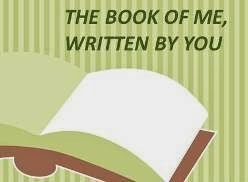 Julie Goucher's inspired series of The Book of Me Written by You will continue in 2015 without me. It's been challenging, it's been fun, sometimes serious. It prompted, reminded, encouraged so many of us to record our own memories and biographical bits. I will continue to add to my Memoirs file. What are your priorities? American author, Kathleen Winsor owns this quote: "Most people are so busy knocking themselves out trying to do everything they think they should do, they never get around to do what they want to do." How much of life is necessary routine and how much is left for "what you want to do"? A lot of adult prime time is naturally consumed with working to earn shelter and food, then transforming the food into meals and keeping the shelter maintained to some minimum standards of hygiene and respectability (unless you're a rabid genealogist). Also to mention the care and feeding and counselling of pop-up junior human beans. Attending to social relationships and obligations take up more time. Genealogists have been known to abandon all such normal human activities, living in bunkers with crates of paper and a figurative umbilical cord to the Internet with all its technological manifestations. Ergo, a resemblance to decent humanity may be accidental. Any genealogist will tell you s/he is doing what they want to do. Lucky us who find or make the time! The way the world works, this generally happens when you reach Seniorhood, that affirmative age of bucket lists and wishful self-indulgence. I do love those tartans, don't I? 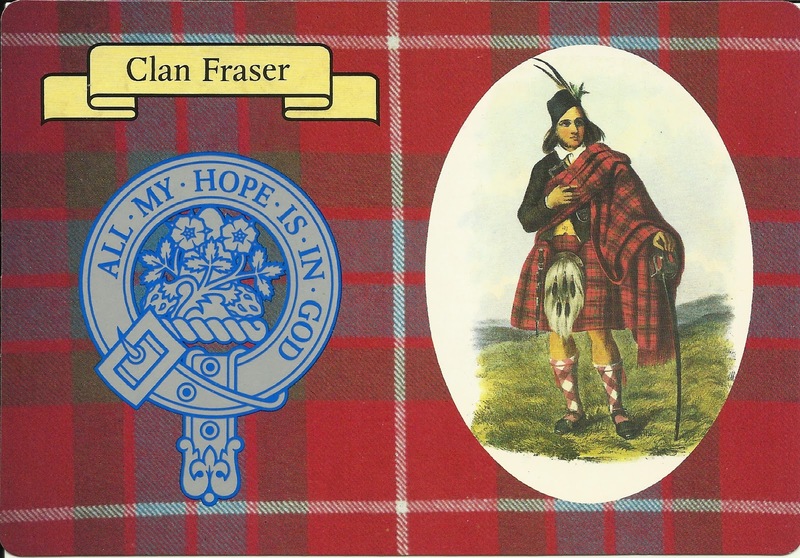 It is resolved that the FRASERS Family History must be completed this year! Secondarily, Brenda must work on revisions to the DOUGALL and LATVIAN ancestors! Julie showed us this image to illustrate the prompt. Think of those who will not be with us for the festive / holiday season. Who would you put on your memory tree and why? friends and family, former pets and colleagues. My parents are up there for many reasons, a strong one being that my children never knew them. I'd put my kids there too, cuz they're not around most any time of the year. Plus a host of other relatives I knew, who left us too soon. This could be something that you have bought from an inheritance, a gift from a family member, or an item from a friend. How do you plan to secure its survival with future generations? Over the years we collect so many things. And we have favourites. Then a lot of us find that we have to downsize at a certain point of life. Maybe more than once. De-cluttering is like a preliminary step. Sentiment must be governed by stern practicalities. Give away or sell. Wedding gifts of a million years ago are useless if they only gather dust. What is the one thing I won't be parted from? My mother's engagement ring, I guess. Or ... And ... Oh my, I seem to be merging this with Prompt 66. Well, literary licence and all that. My children may or may not respect and love my treasures after I am gone. If anyone figures out how to spy on them from the afterlife and threaten the disobedient with unholy disasters, do please let me know before it's too late. Think back to the question we asked in Prompt One - Who am I? Before you review the answers you wrote then, answer the question again. Now compare: Are there similarities? Is it the same, or have any answers changed? In the wider, original question, what have you learnt about yourself and your family? Anything you still want to write / explore? 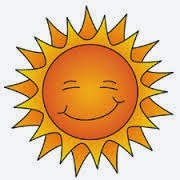 I am a writer, a family historian, a genealogist, a mother, a grandmother, a camel chaser, allergy survivor, and always an optimist, solitary dancer, defender of redheads, and part-time hermit. I see what I did was cheat. I ticked off everything Julie had listed for herself, which I can't find now (good excuse) with a few amendments including camel chaser. Doubting that I've changed a bit over the length of the series. The wider view: Myself is the same writer of irreverent tendency but I still have much to learn about my family, living and dead. And the cosmos is endless for writing and exploring. As my Free Thinker Grandpa would say: So long, see you in the Land of Imagination. ... I decided to have another look at the ahnentafel printout a cousin sent me quite a while ago. Because it purported to take some of my Scottish lines back to the 1200s, I set it aside here in the hope that exposing it to a generally inviting atmosphere would self-generate a few clues about its sources. Didn't happen. Osmosis does not work in all areas of the universe. So what is an ahnentafel and what does it tell you? The German word means a list of ancestors; it's one type of reference tool used by family historians. Each person in the direct lineage is assigned a number in ascending order. We start with a base person, usually oneself. The father's assigned number will always be twice that of the child, and the mother's twice that of the child plus one. E.g. If I am No. 1, my father is No. 2, my mother is No. 3; their parents are Nos. 4, 5, 6, and 7. The numbers multiply exponentially as each generation doubles the number of ancestors. Each woman numerically following a man will be his wife, that is, mother of a child. Typically, each one-line entry would have dates and places of birth and death. Sources for the information are not normally cited. See The Encyclopaedia of Genealogy. After reviewing the chart, I decided to re-format it manually with my father as No. 1 instead of myself. That way, the ancestors would be entirely Scottish, and really, that was the focus of the chart anyway. The process was similar to transcribing a document in that I had to think about each entry. For about five or six generations I knew the correlated "paper trail" of research I had done myself. Once beyond the realm of my own research experience, it was much heavier going than I expected. For one thing, I had thought having about three FRASER lines was complicated but intriguing. The ahnentafel assigns me no less than nine different MACKAY lines. As the names ascend farther and farther back, birth and death information become sparse. Many lines disappear when a dead end/brick wall was reached. The Mackays and a few allied others persisted. And wouldn't you know it ― they frequently married Mackays. Shall I tell you some of the notable ancestors? ― Eoin Macdonald Lord of the Isles 1321-1387 and his predecessors; Robert II Stewart, King of Scotland, ca.1316-1390; Walter Stewart, Lord High Steward of Scotland, ca.1280; Robert I (VIII) Bruce, King of Scotland, 1272-1329; an unnamed sister of King Malcolm IV ca.1137. It's all lovely and thrilling. I couldn't possibly be more Scottish. But uppermost I was asking myself, where is this information coming from? Provenance! Contact with my cousin has been lost but she was not a mediaeval scholar nor a specialist in Scottish archival records. It had the ring of arcane genealogies published by Scottish historians in the eighteenth or nineteenth centuries. My feeling was that someone, some descendant at some time, had copied bits and pieces from those old recorded genealogies ― genealogies with roots in the honourable Highland oral tradition of reciting one's ancestors for generations. A tradition not immune to its own transmission lapses. I was noticing what seemed to be discrepancies in naming practice, in the period before the early 1700s when surnames per se were unknown. 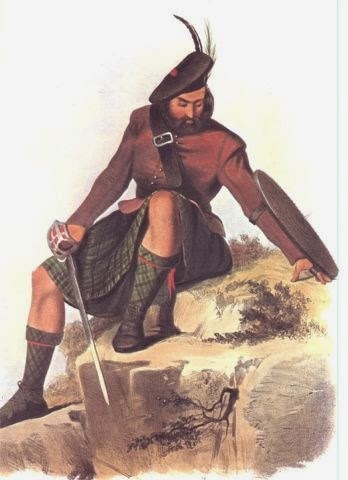 Highlanders were then customarily identified by patronymics, adding father's name and often grandfather's name to their own. A great deal of historical context is necessary to assign such a man to what we now think of as a surname. Idiosyncrasies appear in my ahnentafel such as "Iye Roy (Alexander or Hugh) Mackay ca.1463" and "Iye (Ymar, Ivor) Mackay ca.1305" or "Angus Dow (Duff) Mackay" or "Mac Eth," begging elucidation. Some parentheses may indicate alternate occurrences or spellings of names but the form is inconsistent (and who or what is an "Eth," please? I do know that Iye ‒ pronounced "eye" – was the early name that became the clan name). "Neil Williamson Mackay" for a man born about 1606 strikes an odd note. To my simple mind, would not "Neil MacWilliam Mackay" or "Neil son of William son of Iye" be closer and truer to the Gaelic? In today's world, we would expect the person's Gaelic identification with a translation in parentheses. Or vice versa. But hand in hand with capturing the oral tradition in writing and familiarity with cultural custom is the issue of spelling the Gaelic pronunciations, firstly in Gaelic. I've no idea if modern scholarly consensus has reached a consistency in that respect, but the resurgence of Gaelic language and literature is surely addressing it. Am I expecting too much information from an ahnentafel? I'm no Gaelic scholar, in case that wasn't clear! 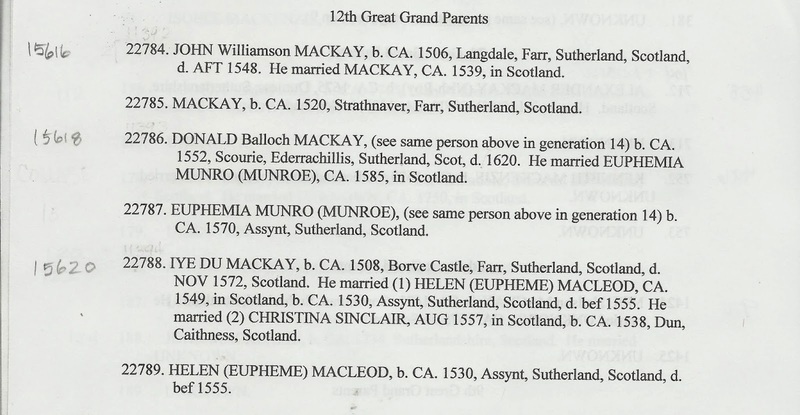 Without belabouring the above points, I found identical forms of address and spellings published in narrative form in The Book of Mackay in 1906 and harking back to History of Clan Mackay in 1826. Both have some basis in earlier works, primarily Gordon's Genealogical History of the Earldom of Sutherland, a manuscript of 1630 that was not published until 1813. These were historians who knew their Gaelic. As well as reference to documents, accounts of oral history were also a likely original source of any Scottish genealogy that reaches back so far. It certainly helps that there are heritors (landowners) in the ahnentafel since land inheritance was a most serious matter. Documentation of land and title charters exist for some of the people. The ahnentafel is littered with place names, the majority referring to what we know as the county of Sutherland, although county delineation came later. Here I found some geographical errors. Strathnaver of enduring northern setting ("Homeland of Mackay") was oddly put in distant Kirkcudbright in 1232. Fowlis was placed in Ross and Cromarty in 1420 although it seems to be firmly planted in Perthshire. Gigha parish was properly in Argyll in 1315 but was suddenly bumped to Ayrshire in 1280. Carrick (as in Earls of ...) was placed in Argyll whereas it was a lordship in southwest Scotland. And so on. Those are not cases of evolving name changes nor are they relevant to spelling variation over a long historical period; learned compilers were highly unlikely to have committed such obvious gaffes. Perhaps each new borrowing, personalized by family historians, repeats or adds such pitfalls. However! I am glad to say that the earliest narratives are more explanatory about names and places than an ahnentafel. Did I mention pedigree collapse? Oh yes: It is visible six times on my particular chart but likely happened more often in the "unknowns." Basically it refers to an ancestor who occupies more than just one entry on a pedigree. The most common example is when cousins marry. They share two mutual grandparents instead of what would ordinarily be four, reducing the expected, purely mathematical, total of ancestors. See "Pedigree collapse" at International Society of Genetic Genealogy. So how did my cousin find the appropriate link to attach to our mutual heritage? Or did she? I don't think I'll find a DNA match to Robert the Bruce any time soon. Angus Mackay, The Book of Mackay (Edinburgh: N. Macleod, 1906); available on Internet Archive, https://archive.org/details/bookofmackay00mack. Robert Mackay, History of the Clan Mackay [with lengthy subtitle] (Edinburgh: Andrew Jack & Co., 1829); available on Google books. Sir Robert Gordon, Genealogical History of the Earldom of Sutherland (Edinburgh: A. Constable, 1813); available on Internet Archive, https://archive.org/details/genealogicalhist00gord.